I think we can all learn how to improve the way science works, just by observing how children explore their world. The best part of my day is after breakfast, when I take my son out for a walk. My son and I get to spend quality time together, and my wife can have some quiet time to do her work (I’ve already done several hours myself during my 5:30am – 9am block). Lately, instead of going to the park, with its slides and swings and plastic toy structures, we’ve been going across the street. To the massive, odd collection of concrete and ramps and hills and grass that is Montreal’s Olympic Stadium complex. The Olympic Stadium “Esplanade”. Or, our personal concrete playground, as it’s often empty during weekdays. My son loves it! We get to climb up and down (and up and down and up and down) stairs, to swing on railings. To run up grass hills, and down ramps. To sit on the pavement and throw rocks down sewer openings. I know we get some very odd looks. 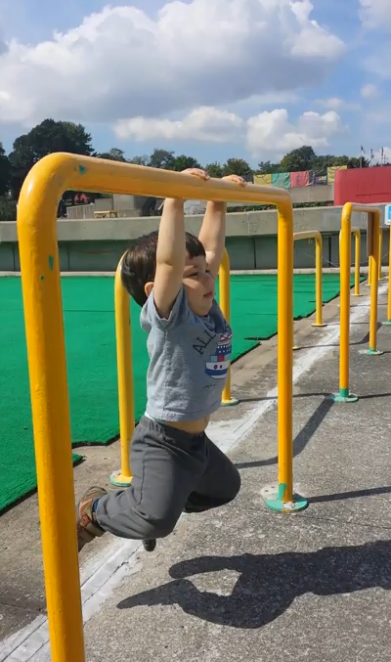 After all, I’m 30, my son is not even 2, and we’re climbing around at random like delinquent monkeys. I find this kind of thinking very often, and its sad. We start labeling things very quickly. And while it’s easy to look at a sign that says “Designated play area for 2-5 year olds, only.” and think it’s comical that things have to be so sharply delineated (what if my son is a week shy of 2 years? ), we forget that the rest of our lives are full of labels and sharp boundaries. And what happens is that, instead of seeing the world as it is, with its infinite array of texture and complexity, we start to see the world as a series of abstractions. Our tendency to label and abstract everything hides the underlying unity and complexity. This tendency to categorize, to set boundaries, to label fields and to label people, is especially damaging to scientific advancement. The longer we live in a categorizing system, the less we’re able to see the patterns and connections between disparate fields. And it’s in the intersection between fields, in the mating and crossing over of ideas, that science flourishes. Unfortunately, as a career researcher, it’s very hard to break out of the categorization system. You may build a reputation as being knowledgeable in a cross-disciplinary field, but I doubt anyone in academia can say that they’re free to research what they please, until far too late in life. (if you feel you are, please get in touch! I’d love to hear from you). If this boxing discussed at all, it’s in contrast to the “gentlemen scientists” of the past, who were free to dabble in all of “Natural Philosophy”. But today, we feel, Science is just too damn big for cross-boundary exploration. I feel that’s mostly a function of two things: the medium by which science is communicated (closed-access, niche journals), and the way scientists are hired, ranked, and rewarded (publication count, successful grants). I am not saying that categorization and labeling is detrimental in itself. Categorization is useful, even necessary. Every living organism is categorized into a distinct species, with its own label, and with mostly clear boundaries. But if we were to stop there, we would conclude that the world is fragmented into 8.7 ± 1.3 million different pieces. Of course, in Biology, organisms are classified into evolutionary trees. Besides being a convenience, this hierarchy is what allows one to always find common ground between any two species. In the same way, we have somewhere between 25,000 and 40,000 different journals, leading us to see Science as an incredibly fragmented space. If instead we had a Tree of Knowledge, every field would be distinct, but there would always be a link between them, at a higher level. Once we build these bridges between disciplines, I hope we’ll be less fearful of crossing into other fields. Less fearful of following our curiosity and inclinations, without worrying about what department you’re in, what journals you publish. Not only would a unified medium for science bridge the gap between different fields… it would also bridge the gap between the “Scientist” and the “Layman”. Citizen science, will one day, I hope, become a redundant term. In the end, I believe that there is much to be gained by allowing everyone the freedom to access, explore, and add to, a unified Tree of Knowledge, without fear. And without fear, scientific discovery can be a process of childlike flow and play from the very beginning, and not restricted to after one has “made their mark”. I look forward to a world where instead of studying for exams, our children are working to make at first tiny, but ever-larger additions or corrections to The Tree. Where we will all be allowed to explore and discover our world freely & without hitting arbitrary walls and borders.